Chromebooks are great while working with documents in the cloud. However, sometimes you do need to print from them. Here are a few different options. Chromebooks are a great device if you’re doing most of your computing in the cloud. However, there are times when you will need to actually print something out. However, printing from your Chromebook isn’t as simple as connecting the printer via a USB cable. There are a few different ways you can go about printing from a Chromebook and here we’ll show you three different options. If you have a fairly new printer that has been made in the past five years or so, it’s probably Google Cloud Print compatible and setting it up is a breeze. 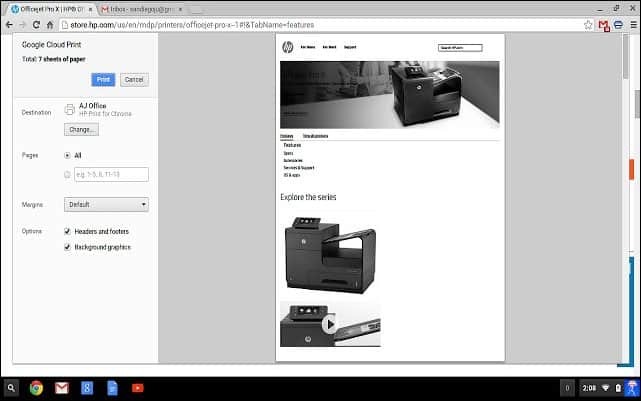 Even if you don’t have a Cloud Ready Printer, you can turn your older printer into one, however, the computer it is connected to needs to be powered on, connected to a network, and have Chrome installed as it acts as the print server. For full details on how to use either type, read our article: How to Print from a Chromebook Using Google Cloud Print. 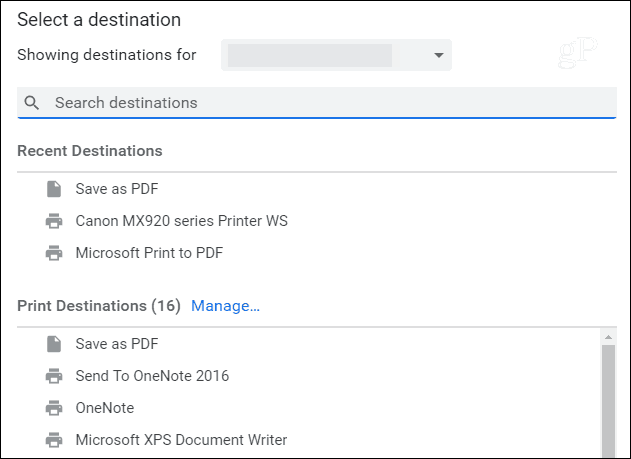 When you’re ready to print a page or document, hit Ctrl + P and choose the printer you need from the “Destination” section on the Google Print page. There will be times when you don’t have a printer set up via Cloud Print or your Chromebook is offline, and you still need to print. If so, you can connect it via a USB cable but there are major caveats. Chromebooks don’t have support for the tens of thousands of different printer drivers out there and the two devices can’t talk to each other. However, if you have the right printer, you may be in luck – namely if it’s an HP printer. If so, check out the HP Print for Chrome extension. It will allow you to print like normal to select HP printer models. Ok, this one isn’t actually printing a document directly from your Chromebook, but it is a viable option. When you print to PDF, it creates a file of the document. Then you can transfer that doc to another computer or device so you can print it without hassle. 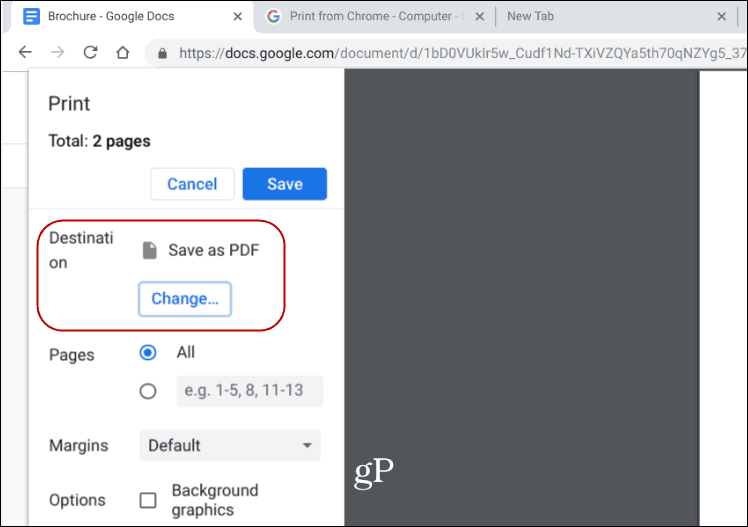 Or, by saving it to Google Drive, it allows you to print out your document when you are in an environment with printing ability. Printing to a PDF or to Google Drive also helps you consider if you really need to print the document at all. Do you really need to print it out just for a friend or colleague to review it? When you hit Ctrl + P change the destination printer to “Save as PDF” or “Save to Google Drive” and choose the most convenient option. Bonus tip: If you’re really in a pinch, you can use FedEx. It allows you to print documents from Google Docs or Google Drive to any FedEx Office location. Check out the FedEx website for more details.